We have our Christmas trees all decorated with lights and our collection of ornaments to which we add a few every year. We also already sent the packages that need International service, which is good, but we still have the domestic shipping so it isn't time to rest easy now. We also still have the outdoor decorations to set up! I used a present cutter that I acquired a couple of years ago to make the sandwiches and made the tree of snap peas, a star cut from mild cheddar, a pretzel stick tree trunk, and a piece of Asiago cheese to keep it from sliding around. 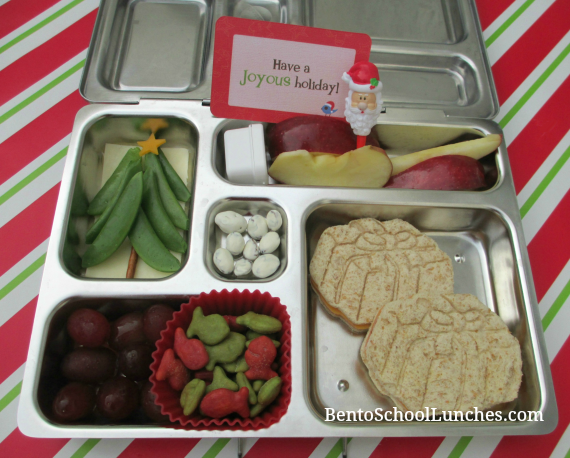 This lunch was packed in a Planetbox rover and I included a Lunchbox Love note for Christmas volume 3. Main compartment - A couple of present shaped sandwiches. Upper left - Sugar snap peas and a pretzel stick on Asiago cheese. Lower left - Seedless red grapes and holiday edition goldfish crackers. Upper right - Apple slices with a Santa cupcake pick and hummus in small container. Festive lunch, great theme! I have not decorated my trees yet but thinking about it and it is reflected in my lunch for today. Love those stamped sandwiches! We've put up our tree last week but not started the Christmas shopping yet, LOL. So festive!! I love your stamped sandwiches and the festive colors in your box!